When you hear the words Lake Norman, you immediately think of boating, fishing, clear waters surrounded by beautiful homes and “Normie”… Normie? …Yes, Normie! This is the name of a mysterious creature that some people call the Lake Norman Monster. 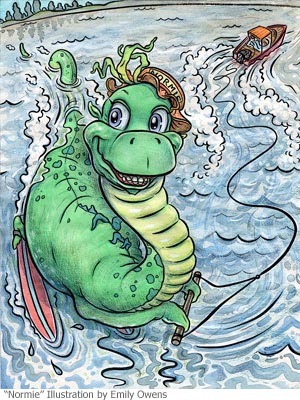 Normie even has a web site – www.lakenormanmonster.com. Matt Myers developed it for people who are afraid to share their monster encounters with others for fear or reprisal or of being ridiculed. The site offers history and facts about Norman, North Carolina’s largest man made lake. More importantly, are the growing number of monster sightings and an easy-to-use form that allows you to submit documentation of your own encounters. The pages of the Lake Norman Monster site provide a tongue-in-cheek introduction to monster hunting by the world famous Swedish Cryptozoologist, Jan Sundberg. Jan is best known for his documentaries on The Learning Channel, including one entitled “Loch Ness: The Search for The Truth”. Visitors to the site can sign up for a free monthly newsletter, send free E-Cards featuring a cartoon image of Normie and purchase souvenirs and monster hunting paraphernalia. Exactly what’s all the commotion about? Could the monster be real? Does it exist? These questions and others are anybody’s guess. However, in February 2010 the number of monster sightings spiked. Five encounters, during a very cold winter month, give credence to the theory that Lake Norman does, in fact, have a monster of its own. Chances of seeing Normie are better after dark. Normie roams the lake, but has been sighted on several occasions in Hicks Creek, which flows through the Lake Norman State Park. In fact, at the park’s lake entrance is a rock formation with an eye painted on what appears to be the head of a monster. Some call it “the monster rock”. Normie is boat shy. Don’t get too close or he will swim away. Report sightings as soon as possible to www.lakenormanmonster.com. Do not feed or pet Normie. Captain Gus Gustafson of Lake Norman Ventures, Inc. is a member of the Southeastern Outdoor Press Association and a full time Professional Fishing Guide on Lake Norman, NC. Visit his web site, Fishin’ with Gus! at http://www.fishingwithgus.com/, or call 704 617 6812. For additional information, e-mail him at Gus@lakenorman.com. This article is reprinted with permission of The Baby Boomer News.